The Fourth Industrial Revolution (4IR) offers huge potential to transform and realign our economies and societies. There is an increasing realisation that the 4IR could also exacerbate problems for people and the planet. The G20 should champion a holistic approach to the 4IR that helps to address society’s environmental and social challenges. This means both mitigating unintended adverse consequences of change and maximising positive social and environmental benefits. The G20 should explore, and recommend, governance structures and policy mechanisms to ensure governments have the agility and ability to keep pace with the 4IR, and harness innovations that promise the greatest social and environmental returns. As part of PwC’s overarching narrative for the T20, we discuss how three drivers of change – globalisation, technological advances and “financialisation” – have historically served humanity well by typically delivering both economic growth and social progress. However as these drivers have accelerated, evolved and become intertwined over time, divergence between economic growth and social progress has occurred placing people and the planet under substantial strain. In this paper we look forward to how today’s technological-driven revolution – the 4IR – can course correct this trend, with the right governance, enabling environment and public-private partnerships. Humanity stands at an important moment in history. The global, digitally-enabled 4IR is already the fastest period of innovation ever. It is underpinned by rapid advances in technologies including artificial intelligence, robotics, the internet of things, nanotechnology and biotechnology, to name a few. The disruption of many traditional markets and industries is already underway. How can we shape these transformations to address society’s and the Earth’s most pressing challenges, and not exacerbate them? Previous industrial revolutions advanced economic development but have largely come at the expense of the planet. Today there is mounting scientific consensus that Earth’s systems are under unprecedented stress. Scientists at the Stockholm Environment Institute have identified that four out of the Earth’s nine ‘Planetary Boundaries’ have already been crossed, namely climate, biodiversity, land-system change and biogeochemical cycles. Risks will only heighten as population swells to a projected 9 billion by 2050, increasing food, materials and energy needs. In parallel, society today is under growing social and economic strain, from mounting inequality, youth unemployment, automation, geopolitical volatility and nationalism. These global challenges of today are framed by the UN’s 17 Global Goals for Sustainable Development (SDGs). Agreed by 193 countries in 2015, the SDGs provide an action agenda for people and the planet out to 2030. There is a window of opportunity now, to make the sweeping advances of the 4IR help governments, business and society to achieve these goals, not make them harder to attain. For governments and policy makers, it is vital that the enabling mechanisms are put in place for the 4IR to be a sustainable revolution. The innovations and economic value unlocked by the 4IR must maximise positive social and environmental impacts, and avoid exacerbating today’s most pressing challenges. The governance challenge is even greater than in previous industrial revolutions due to the complexity, pace, and global and sectoral breadth of change. Zero-cost digital distribution today enables products and services to penetrate the mainstream and ‘go global’ in a matter of months, with policy and regulation often struggling to keep up. One example of this challenge is the high profile OECD BEPS initiative now being implemented to address tensions in the international tax system created in part by the impact of technology on business and how multinational companies invest. For the 4IR to be the first sustainable industrial revolution, governments and regulators will need to adapt quickly with the rapidly evolving 4IR landscape and provide the enabling environment, safeguards, investment and oversight to guide the future that is being built. Support and partnerships will be needed to unlock and scale innovation on emerging – and potentially game-changing – technologies and solutions for people and the planet. And foresight, public policies and technological governance will be needed to avoid or minimise unintended consequences and protect public interests. United Nations, 2017. Sustainable Development Goals. 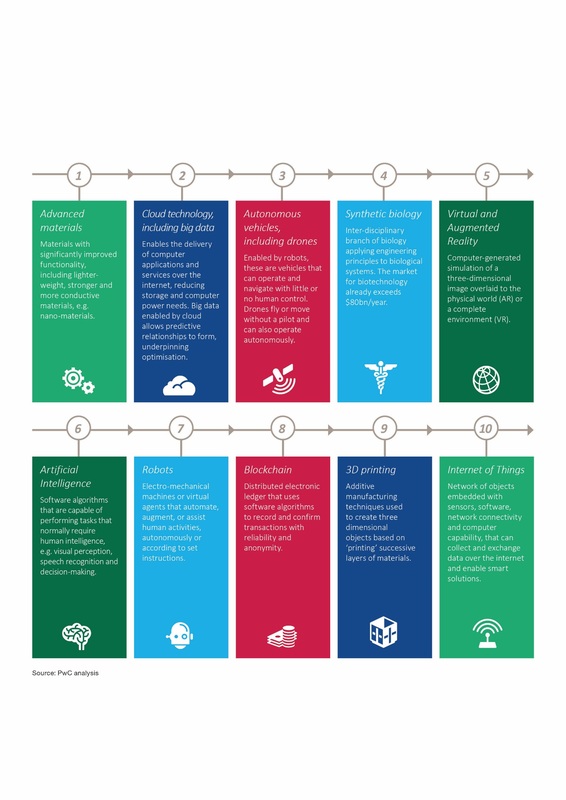 Amid a rapidly changing innovation landscape, we have identified 10 emerging 4IR technologies that we think could individually and collectively have the greatest impact on jobs, livelihoods, and environments (Figure 1). PwC, 2017. Innovation for the Earth. Source: PwC, 2017. Innovation for the Earth. To harness the potential that these technologies promise for people and the planet, governments and policy makers need to go beyond simply accelerating innovation, and take a more comprehensive approach. 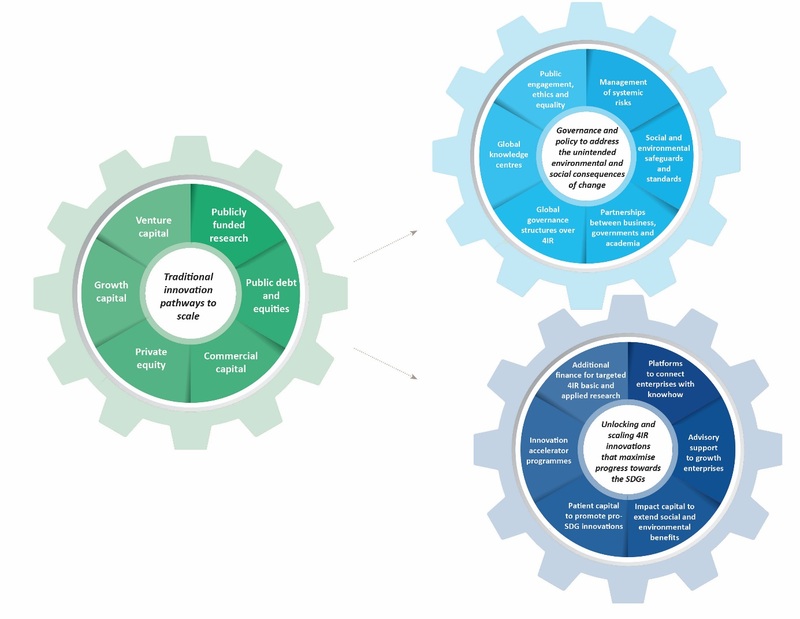 This includes: (a) building the global governance structures and policy mechanisms to address the unintended environmental and social consequences of change; and (b) unlocking and scaling 4IR innovations that maximise progress towards the SDGs – including innovations that respond to the new risks and challenges presented by the 4IR itself (Figure 2). In practice, this will often involve ‘open innovation’ across the full ecosystem of actors, collaborating to develop and shape our future world. 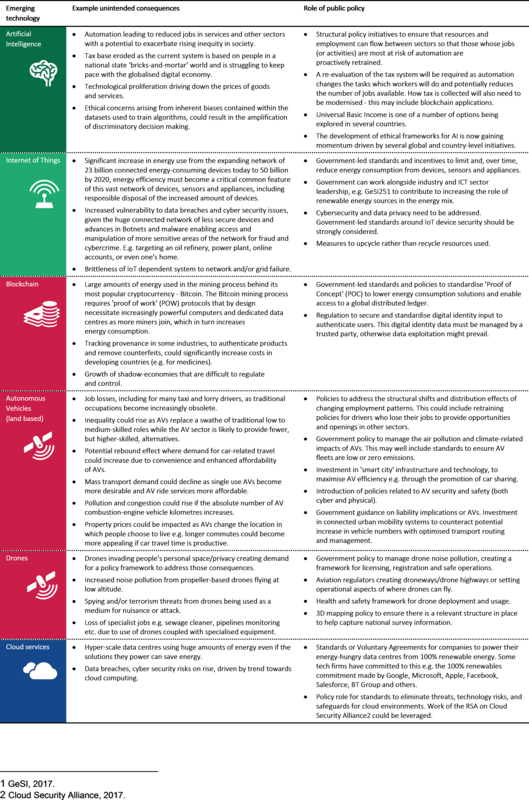 We have identified four areas where the 4IR poses governance challenges and opportunities that are unlike the previous three industrial revolutions (the third starting almost 40 years ago). First, the 4IR is moving at lightning speed driven by exponential computing power, the internet, mobile infrastructure, and global competition. By contrast, governance structures typically move at a much slower, analogue, pace. There is therefore the potential for governance, policy and regulation to lag far behind new systems, industries and solutions in the 4IR. Second, trust in society of institutions is at post-WWII lows in many western economies; fear of what technology might do for jobs, livelihoods, and society is also rising. Third, the environmental and social impacts of technology on sectors, labour markets, activities, and products is better understood now than during previous industrial revolutions. Finally, through the global connectivity and reach enabled by the digital platforms, social networks, and technologies which underpin the 4IR, coherence and effectiveness of policy, and oversight across borders, is increasingly challenging in the absence of a global regime for technological governance. Given these four overarching considerations, it will be essential for international organisations and national governments to explore this topic more fully across a range of areas. Importantly, governance structures will need to be updated and refocused to keep pace with the rapidly-developing 4IR-enabled digital economy. In particular, as 4IR technologies are designed, deployed and scaled, environmental and social impacts will need to be considered upfront to minimise harmful unintended consequences and to embed resilience and sustainability in emerging global systems. A number of mainstream 4IR advances could have unintended negative consequences, or introduce negative risks, that need to be minimised. Below is a selection of illustrative examples of emerging technologies, potential unintended consequences, and examples of the roles of public policy. Taxes (and subsidies): to dis-incentivise (or incentivise) activity in certain areas or sectors through fiscal instruments e.g. carbon or landfill taxes, subsidies for renewable energy. Cap and trade: to lower, and limit, the volume of emissions or pollutants by capping emissions. Permits are then used for market participants to trade emissions permits e.g. Emissions Trading Systems, US Acid Rain Programme. Voluntary agreements: facilitated by governments or regulators for certain sectors or areas, which can be looser but sometimes offer effective low-cost changes where industry is ready and willing to cooperate e.g. sector agreements to reach 100% renewables electricity generation. If companies do not cooperate, however, a more comprehensive suite of policy options would need to be employed. Standards: to limit or specify levels of emissions, pollutants, efficiency, or energy use e.g. car emissions or exhaust standards. Public procurement can also include standards on supply chains for firms or products to meet e.g. environment and / or social requirements. Mandatory phase-out: utilised to ban certain activities or products over time e.g. the incandescent light bulb in the European Union. Public research: using government institutes to initiate or accelerate solutions e.g., mitigation of environmental impact, biodiversity protection, carbon sequestering techniques etc. Retraining and skills: to manage the flow of resources from contracting sectors to fast-growing sectors. Initiatives might include retraining, skills development, and provision of transitional support facilities. In addition to these broad mechanisms and levers, governments and policy makers can also take a number of direct focused steps to support breakthrough innovations and promote commercialisation. These include: targeted research and development (R&D) funding and tax incentives; innovative public-private financial instruments including patient capital and risk underwriting; technical advisory support; and facilitation of connections and partnerships between entrepreneurs and large-scale commercial businesses with the knowhow to scale innovations. 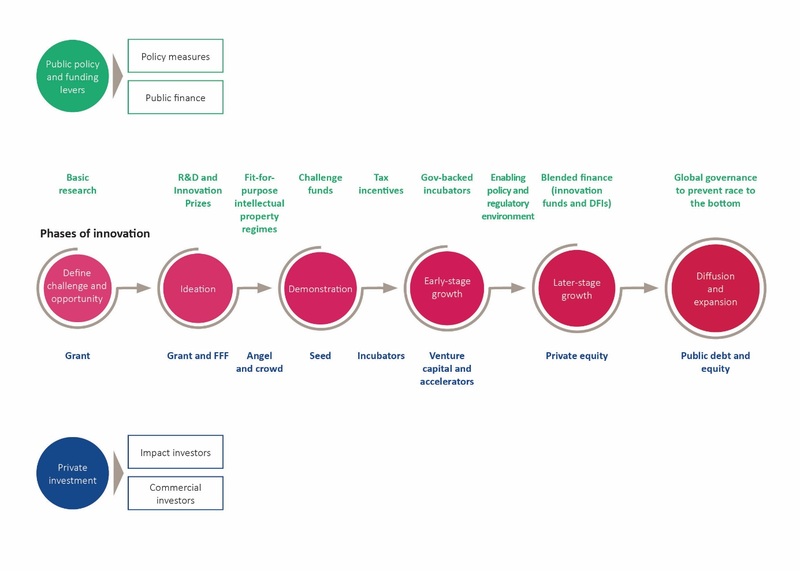 Figure 3 below outlines, in a simplified chronology, the range of public policy levers and accompanying sources of private capital, which can help to accelerate innovations on a pathway from ideation to scale. In parallel, institutional moves need to be sequenced across the innovation cycle to maximise levers and finance options. For example, innovative start-ups can struggle to gain finance from Venture Capital (VCs), who often prefer proven technologies with track records on which to base investment decisions. There can, therefore, be a critical role for angel investment, incubators, patient capital and government-backed innovation vehicles and incentives. To realise the overarching opportunity of accelerating and scaling 4IR technologies – in a way that provides innovative solutions that help to realise the SDGs – the full range of sources of public and private capital will need to be drawn from. This will include, private, philanthropic, corporate and public investment; and it may include both traditional commercial investment seeking primarily financial returns, as well as innovative impact investments which seek a blend of financial and (social and environmental) impact returns. For Energy, one of the key 4IR innovation challenges is for technology breakthroughs to enable a next-generation clean distributed grid with virtual power plants aggregating millions and soon billions of emerging renewables sources, all optimised by AI and machine learning, with blockchain and IoT enabled peer-to-peer trading. In Transport, advanced materials including graphene and nano-solutions are close to underpinning battery breakthroughs for inexpensive, quick-charging energy-dense batteries. This could disrupt the market for carbon-intensive internal combustion engines and make electric cars both performance- and cost- competitive. In Manufacturing, circular global supply chains could be more quickly realised utilising the “Industrial Internet of Things” (IIoT) coupled with AI, robotics, virtual reality, drones and advanced materials. In Retail, technology could fundamentally transform resource-heavy consumption, developing from a new system of virtual shopping, point-of-use 3D printing, blockchain, AI and IoT-enabled supply chain transparency and accountability, and circular and sharing economy models. In Finance, Fintech, including AI, blockchain and IoT, enable increased access and decentralisation of the financial system to serve the unbanked and underbanked, improve market integrity and could perhaps provide early warning signals of systemic financial strains. These examples are only a few illustrations of the transformations to traditional sectors enabled by 4IR technologies that can also lead to positive social and environmental impact. In many cases emerging solutions, across sectors, are realised by fusing together a number of 4IR technologies – with AI and data, IoT and blockchain in particular often coming together as a “4IR gearbox” for change. The potential is there for 4IR technologies to come together to drive broader structural changes in our cities, across our transport and energy networks, to our financial markets, and through our industrial value chains. This is why it is important that innovation initiatives go beyond investment into a single technology or specialisation, but also create opportunities for connection and collaboration to unlock game-changing outcomes. 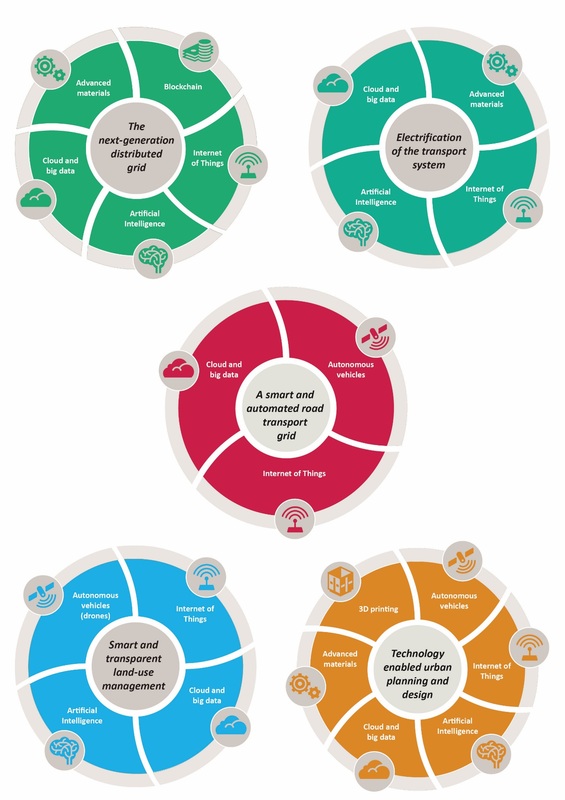 To illustrate this further, in the recent PwC Innovation for the Earth Report, we identified five key 4IR innovation game-changers for two of the SDGs 7 and 13 (Affordable and Clean Energy, and Climate Action) which fuse together 4IR technologies and present substantial potential to underpin a zero-net-emissions economy (Figure 4). Bringing this together, below we set out some initial steps to consider. These recommendations would involve the G20, together with international organisations, collaborating with multiple stakeholders from politics, industry, academia and the civil society. G20 led, and supported, collaboration, can help ensure that the 4IR supports global growth which is inclusive, sustainable, and aligned to delivering the SDGs. The G20 should champion international technological governance structures to support 4IR-enabled solutions for the SDGs. This would provide the policy and enabling environment to enable scaling of 4IR technologies that contribute towards achieving the SDGs. Open architecture models ought to be explored to enable sharing technological advances and data. Intellectual Property considerations will also need to be addressed. Governance structures and policy safeguards will want to consider international competitiveness, particularly to avoid a “race to the bottom” in terms of tech firms’ jurisdiction for corporate, fiscal, and legal objectives. Building public trust will also need to be a central principle of 4IR governance structures. 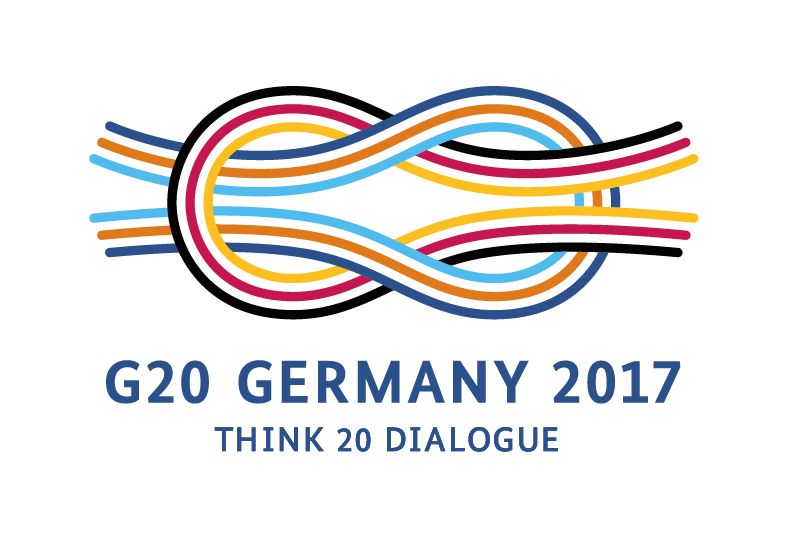 The G20 should identify and promote essential safeguards to ensure a Sustainable 4IR to minimise unintended negative consequences (e.g. developing international standards and regulations for blockchain, IoT devices, cloud data servers etc.). The Global Blockchain Forum – an international body whose mission is to shape international blockchain policy – is a step in this regard. Appropriate safeguards will also need to be developed to ensure security of data and digital identities. The G20 should promote a coordinated effort by governments and regulators to identify and manage systemic risks emanating from the 4IR. The focus would be the effect on financial institutions in particular and financial stability more broadly. The Bank of England and Financial Stability Board’s work on climate risk and financial stability is an example on which to build. These efforts could be broadened to include how tech investments and new business models are recognised and are being accounted for, as well implications for tax policy and fiscal stability. Regulators will also need to be modernised – working with RegTech innovators to harness 4IR solutions for their own systems to provide adequate oversight and supervision to sectors in the midst of rapid and structural transformation e.g. Fintech and Energy. The G20 should encourage countries to develop responsible technology policies, which would include employing social and environmental considerations in countries’ national digital strategies. Governments should employ a joined-up approach to the 4IR within their country, including provision of interdepartmental oversight across government functions to ensure technological social and environmental safeguards, and opportunities, are managed in a holistic way. One specific lever could be for governments to require their procurement supply chains to meet specific standards, or safeguards, to tender for public sector contracts. The G20 should make a call for G20 governments to commit large scale basic and applied R&D investments towards priority Sustainable 4IR challenges. Coordinated and targeted large scale fund commitments are required, encouraging research and funding collaboration on ‘4IR for Good’ between industry, academic and government research agencies. The efforts of Mission Innovation to set ambitious targets and coordinate investment across over 20 countries for clean energy solutions is one example. The G20 should steer basic research funding and priorities to encourage interdisciplinary research that bridges technology, social and environmental disciplines. Multi-disciplinary education and research programmes are vital to fuse together technology, earth and social sciences. This would include integrating sustainability and ethics into the curriculum of digital/technological/STEM-related undergraduate and graduate courses, and integrating technology into earth and social science curricula. MIT, for example, has taken on climate change as a ‘priority’, involving thousands of students, a third of the faculty, and more than 40 start-ups. In addition, Stanford University has developed a suite of 1-credit ‘Big Earth’ courses that use big data analytics to examine or solve questions about the planet. School children will also need to be fully engaged and trained for the 4IR. The G20 should promote national and international PPP initiatives, programmes and funds to unlock and accelerate ‘4IR for Good’ innovation. This would include innovative public-private partnership finance solutions to support early stage commercialisation of 4IR for social and environmental impact solutions, including risk finance (grants, concessional debt and equity), innovation prizes and challenge funds to promote ideation, and government backed incubators and accelerators to support pioneering new companies and ventures to scale. The G20 should promote the establishment of a 4IR knowledge hub, a real-time central knowledge hub (driven by 4IR technology) that would democratise critical 4IR knowledge and data for business and society. The scope of this work could include, but would not be limited to: sharing thinking and information on 4IR developments early in the process; curating and consolidating standards in consumer markets across countries; disseminating information about social and environmental impacts; a data-library, including providing a central database of 4IR-related academic and other research work and data. The G20 should openly and actively promote a global “tech for good” campaign to educate people and industry about how technology can be a force for good. The campaign could promote and disseminate, in conversation and collaboration with the media and technology firms, information about how unintended consequences and adverse effects are being mitigated, and how technologies are being developed and deployed to realise social and environmental goals. Education can raise awareness, build necessary 4IR skills in schools and universities, as well as alleviating the fear of the unknown and the generation gap. The G20 should actively champion companies to support a Sustainable 4IR. Governments, with industry input, should create policy and incentives that encourage corporate policy and governance for responsible technology, including developing business charters for responsible technology. The private sector also should be encouraged to advance, build-in and optimise the impact of technologies on sustainability in companies’ technology strategies. Entrepreneurs and designers need increasingly to embed sustainability into design principles so that mainstream 4IR technologies are in fact ‘smart’. Companies should be encouraged to collaborate, with the UN, across their industry, and with regulators, to aid standard setting e.g. consensus protocols and targets. The G20 should support the creation of a better data environment – including access and data skills – to maximise the opportunity of big data and machine learning for sustainable 4IR solutions. As data is one of the key building blocks to drive innovation in the 4IR, effort needs to be devoted to improving the systems by which we define, gather, access and manipulate data. This includes government initiatives for open public data, and policy frameworks (or agreements) to make strategic data available to specific users – with associated safeguards – for the purposes of big data and machine learning to tackle societal and environmental challenges. It also requires investment in skills and capability at every level, from establishing basic data literacy in schools, through to fostering the uptake of sector-specific applications within industry and the cultivation of world-leading big data and machine learning knowledge and capabilities within universities. The G20 should develop a policy framework that supports tech companies, research institutes and universities to manage potential systemic bias in algorithms. Crowd-sourced raw data that tech companies use in their algorithms typically reflects the biases and prejudices inherent in society at large. This has led to a series of instances where algorithms have produced results that have been perceived as discriminatory (e.g. on race or gender grounds). Policy frameworks are needed which balance concerns around unfairness and discrimination in publicly-sourced big data with the technical and ethical challenges as regards monitoring, and potential censoring, of data. The G20 should support an initiative or commission for academics, technologists and other stakeholders to determine a concrete process to hold algorithms and their owners accountable, whether that’s algorithmic transparency, oversight commissions or another form of algorithmic accountability to ensure certain values are encoded and implemented in the algorithmic models, from avoiding discrimination to optimising for minimal energy usage. The G20 should consider and evaluate ethical aspects of the relationship between people and machine systems, which would include implications for privacy, scope and boundaries to human / digital augmentation and the rights of people. This should include instituting policies and procedures that ensure that ethical aspects of cyber-physical systems are identified, evaluated and appropriately addressed. Security of data and digital identities will also need consideration. The G20 should recognise and support the work being done to give every person in the world a unique digital identity. There is currently an initiative that directly addresses the UN sustainability goal 16.9: “by 2030, provide legal identity for all, including birth registration”. ID2020, in partnership with the Gavi foundation (an alliance who collectively vaccinate circa 93% of the world’s population), aims to harness the 4IR to give a digital identity to everyone. This initiative would secure recognition before the law and safeguard individual rights and access to justice, public services, banking, visas etc. Finally, we propose that the T20 considers establishing a dedicated taskforce on “Sustainable 4IR” to enable the T20 to provide expert input to G20 policymakers on this crucial cross-cutting area for cooperation and policy-making. The taskforce would include recognised global experts across emerging technologies, social and environmental challenges, and industry-specific experts. It would recommend solutions and governance structures that are agile and flexible enough to navigate and support rapid 4IR innovation – across the digital, physical and biological domains of the 4IR – in a sustainable way. The taskforce would be linked to, and work closely with, the Digital Economy taskforce and the 2030 Agenda Taskforce, but with a specific mandate to steer the 4IR (incl. the digital economy) to meet the SDGs. PwC, the World Economic Forum and Stanford University’s Stanford Woods Institute for the Environment are collaborating on a new initiative on 4IR for the Environment. We are hosting a series of dialogues (face-to-face and online), producing a series of insight reports that map 4IR innovations against the world’s biggest environmental issues, and offering WEF’s new Center for the Fourth Industrial Revolution in San Francisco as a focal point for stakeholders who are interested in collaborating. As part of the initiative, we are also building an accelerator platform where concepts can be turned into tangible ventures and collaborations that help scale innovations. Key additional expert input on the paper provided by: John Tress (PwC), Brad Silver (PwC), Susanna Berger (PwC), Hilary Eastman (PwC), Jan McCahey (PwC), Sheridan Ash (PwC), Jas Sidhu (PwC), Mark Milton (PwC), Paul Grosvenor (PwC), Szilvia Kocsy (PwC), Neville Howlett (PwC), Andrew Packham (PwC), Sarah Franklin (PwC), Anuj Kharbanda (PwC), Lizzy Fitzgerald (PwC), Tom Hill (PwC), Jonathan Grant (PwC). This publication has been prepared for general guidance on matters of interest only, and does not constitute professional advice. You should not act upon the information contained in this publication without obtaining specific professional advice. No representation or warranty (express or implied) is given as to the accuracy or completeness of the information contained in this publication, and, to the extent permitted by law, PricewaterhouseCoopers LLP, its members, employees and agents do not accept or assume any liability, responsibility or duty of care for any consequences of you or anyone else acting, or refraining to act, in reliance on the information contained in this publication or for any decision based on it. © 2017 PricewaterhouseCoopers LLP. All rights reserved. In this document, “PwC” refers to the UK member firm, and may sometimes refer to the PwC network. Each member firm is a separate legal entity. Please see www.pwc.com/structure for further details. Cloud Security Alliance. (2017). The Cloud Security Alliance. [online] [Accessed 9 May 2017]. PwC, (2017). Innovation for the Earth: Harnessing technological breakthroughs for people and the planet. [online] [Accessed 9 May 2017]. PwC, (2016). Tech breakthroughs megatrend: how to prepare for its impact. [online] [Accessed 9 May 2017]. The Royal Society, (2017). Machine learning: the power and promise of computers that learn by example. [online] [Accessed 9 May 2017]. Schwab, K. (2016). The Fourth Industrial Revolution: what it means and how to respond. [online] World Economic Forum. [Accessed 9 May 2017]. Stanford University. (2017). Big Data Courses. [online] [Accessed 9 May 2017]. Steffen, W., et al. (2015). Planetary boundaries: Guiding human development on a changing planet. Science, 347(6223), pp.1,259,855-1,259,855. The United Nations. (2017). Homepage | UN Global Compact. [online] [Accessed 9 May 2017]. The United Nations (2017). Sustainable Development Goals: Sustainable Development Knowledge Platform. [online] Sustainabledevelopment.un.org. [Accessed 9 May 2017].